There is a blog called Our Creative Corner that posts a weekly sketch challenge. 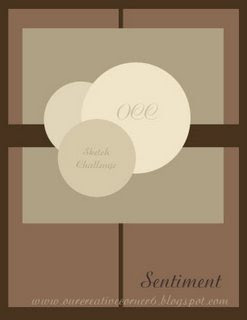 If you're not familiar with sketch challenges, they're fairly ubiquitous in crafting blogland. Many paper crafters and stamp companies create sketches for card layouts and invite anyone interested to post a card made using the design. OCC posts every Saturday, and this week's designer is Laurie Schmidlin. I follow her blog because every time I type "just" in my web browser, her blog, Just Give Me Stamps, comes up just below mine! Laurie's well known in the stamping community, and this sketch and interpretations of it have popped up in quite a few of the blogs I follow. Since I need some cards for this Saturday's SAS--I work well under deadline pressure--I decided to try this one. I wanted a masculine card, and this one, with its large panels, seemed to lend itself to such a beast. (Yes, they're hard to make, and can make me testy.) I pulled out Manchester DSP, Baja Breeze, Kraft, and Very Vanilla card stock and went to work. Circles seemed too feminine, and I don't have that many manly man images. Birthday Whimsy was sitting out in my peripheral vision, and each of its images is similar in size. A perfect trio! I stamped the cake in Always Artichoke, which matches fine IRL (don't know what happened in photographing), the balloon in BB, and the present in Sahara Sand (why we don't have an ink pad in the color Kraft, I don't know). The twill ribbon was also laying around on the craft table, so I pulled it into the layout for the horizontal piece the sketch suggested. It's a tad plain, but for a guy, I think it'll be just right. I have two more cards to figure out for Saturday, so you'll be seeing more this week. What kinds of cards are you working on these days? What a fantastic and creative way to use the sketch! Your card is darling! Your card is so cute. I love the lay out and the colors you used. Thanks for sharing. I'm so sorry I won't be able to make this beautiful masculine card!!! This willb e the first time in 2 years I miss a SAS!!! I really like it. "Circles seem too feminine" is cracking me up! !